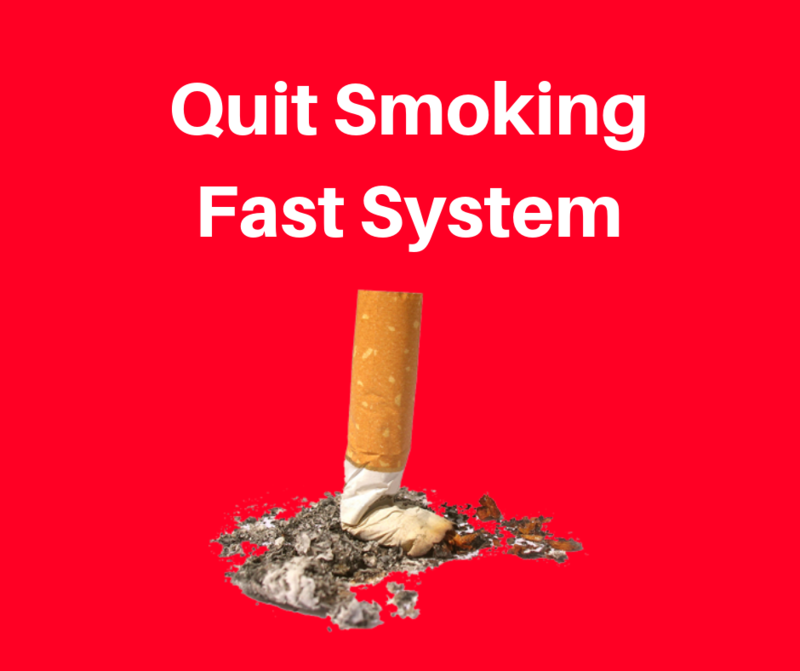 This Video Below explains what the Quit Smoking Fast System is all about and why it is different to any other method. It is far more effective than hypnosis alone. 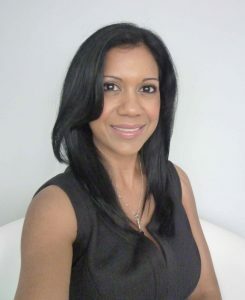 Wahida doesn’t use aversion therapy which is a temporary quick fix but neuroscience, NLP Craving Reduction Methods and other rapid mind transformation techniques combined with Hypnosis to make you walk away a non smoker. Also below are Proof Testimonial Videos from Successful Clients who have Quit Smoking using this method. Our Stop Smoking Clinics are in Wokingham and Ascot covering all surrounding areas. .
How to Stop Smoking in 2 Hours? 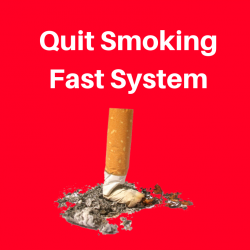 Quit Smoking Fast in Ascot Berkshire covering Windsor, Marlow, Maidenhead and all surrounding townsWahida Finlay Dip Hyp, MNCP (Member of National Council of Pyscotherapists) , Kinetic Shift Practitioner, EFT /NLP Practitioner. Wahida Finlay has been helping people to quit smoking since 2012 using Cutting Edge Techniques in Rapid Mind Transformation, Hypnosis and NLP also combined with Hypnosis far superior than Hypnosis alone and is the quick, easy and highly effective . This means that change is permanent, zero cravings, no weight gain and no desire to smoke. Why do people find it hard to Quit Smoking ? Clients say that they consciously want to stop smoking desperately, yet they still find themselves smoking. Why is that? We have clients with life threatening illnesses, physical conditions and pending cancer treatment, yet they still smoke and continue to do so. They seem unable to stop even though their lives are at risks or even if a family member has just passed away you would have thought it would be an easy way to stop for good. Addictions live in the illogical unconscious mind. The conscious mind can desperately want to quit, but as long as the unconscious mind still wants to smoke, a contradiction will be present, leading to the stop-start-stop-start cycle. Incorrect and misleading information and misunderstanding about Nicotine and the addictive element of it means that people think they are addicted. In fact the addictive element of nicotine is so miniscule and it is a habit not an addiction. If it was as addictive as any other drug or alcohol addiction then so called “nicotine addicts” would wake up every few hours and need a fix. In reality the body does not need that nicotine hit. It is the mental mind that remembers the need to smoke or associate it with tasks that you do throughout the day. It is ingrained in your mind as a habit. Just like popcorn and cinemas. This is is easily fixed by understanding neuroscience and the plasticity of your brain and its ability to change or inability to change. So if Smoking is a HABIT….then why can’t I quit? That is why Nicotine and Patches do not work. Nicotine patches and nicotine replacement therapy and vapes will not work for habits. Medication will not work for habits. If you can get your mindset on track and understand your habits in those 3 days following your decision to quit, then there is no physical need of cigarettes after 3 days as all the nicotine would have left your body and your body wouldn’t need nicotine any more . It should therefore be plain sailing as the hard part would be over. But if you continued to keep pumping your body after those 3 days have passed with even more nicotine and vapes or nicotine patches/ gum then you are refuelling your body with more nicotine so you don’t stop at all and that cycle continues. It is hard to quit if you are not aware of how to change a habit and neuroscience has easy ways to train your brain to do that. Smoking can be a thing of the past once you know how and once you change your mindset and no longer want it. We identify your conscious and subconscious smoking habits and patterns. Discovering whether the thoughts and associations and habituated thought patterns are to do with emotional triggers such as boredom, stress, rewards or whether they are physical associations linked to drinking that cup of tea, walking in from work, before bed etc. Wahida will go through every type of cigarette that you smoke so that you can identify triggers and associations and work out a plan to eliminate them individually. Using NLP and Neuroscience methods she will go through a number of Craving Busters to remove the desire and cravings immediately. You will be taught how to manage stressful situations that may arise in the future so you do not go back to smoking again. You will also be given a hypnosis MP3 recording to use for many years to come that you can listen to during times of stress in the future. You won’t need to listen to this recording at all however as you leave a non smoker. It is just there should you have a stressful situation in the future which you feel you cannot manage to cope with. You will be trained using an NLP embedded anchor how to set a command to your brain to let stress just lift out of you by a simple command which you will taught in your session with Wahida so everyday stress situations at work or an argument with someone will not have you reaching for a cigarette. Will I act like a chicken or lose control? You will go through some negative mind conditioning with embedded commands highlighting to your brain the poisons, toxins in cigarettes, death and health risks to make you not want to smoke. Your eyes will be open and you will not lose control at all. You will also get positive mind conditioning and work out your deep rooted reasons for wanting to quit to reinforce your health benefits, wanting to live longer, to see your family grow up etc. The mental conditioning process will challenge your mind and drag your thoughts in different directions until your mind has accepted that it no longer wants it. Everyone is suggestible if you can hold a focused thought or concentrate for a few moments at a time and follow simple instructions. So if you have learning difficulties or inability to think or remember a sad feeling or bring happy feelings to your mind through thoughts then perhaps hypnosis is not for you. 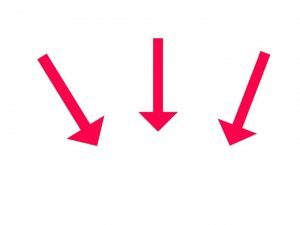 There are other methods and eyes open methods that work perfectly fine to help you stop using these same method. Most people can think of slicing a lemon and making their mouth fill with saliva just by thinking of tasting the lemon. Hypnosis is like that. During hypnosis which is a concentrated thought, like a daydream, you can still itch your nose, you can cough and you can cry and talk back to us. You do not pass out or flop to the ground like on TV. It is a relaxed state of mind where your brain is receptive to suggestions. This means we can bypass your conscious critical faculty and can imprint your subconscious mind with suggestions to make you not desire cigarettes ever again. Hypnosis will help you to eradicate all need and desire to smoke so you do not need it and can be around other smokers. It will leave you with a freedom mindset and not feel like you are missing out on anything. Hypnosis is not magic and it is a two way partnership. Wahida will guide you through the processes but you will need to concentrate and understand. You will be required to go through the session in detail together and craving busters. Nothing will happen to you. You do it to yourself and put yourself into hypnosis by following her instructions. If you sat there thinking of your dinner or refusing to take part in the hypnosis or NLP tasks and craving busters then you will not walk a way a non smoker. A hypnotherapist does not wave a magic wand and off you go. You play a crucial role in making this work. If you are hoping that someone makes you do something then this is not how it works. We are not magicians, there are no wands, we don’t do anything to you. The change is down to you if you do the work. The only person responsible for your actions is you. Whether they are positive actions or negative ones. 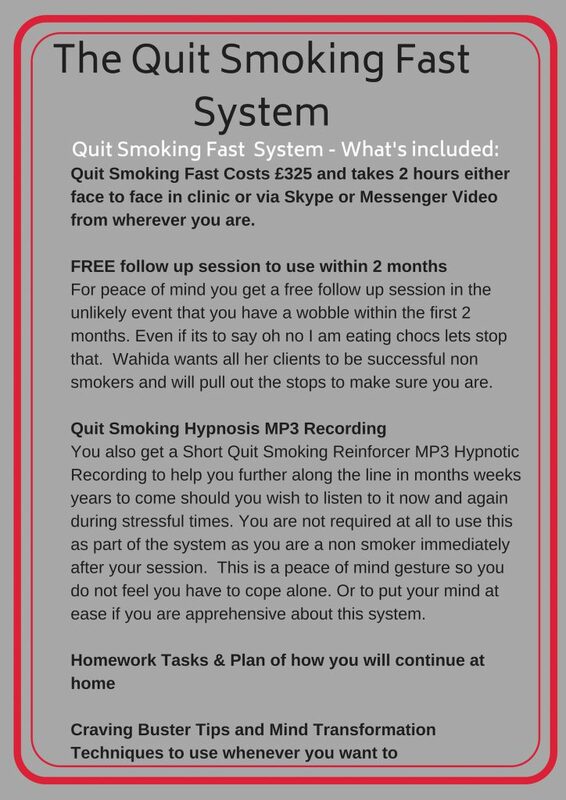 If you possess the desire to be a non smoker and are committed to stopping now then Hypnotherapy is a great choice for you and you will be delighted with the rapid immediate outcome. You can walk away a non smoker immediately and enjoy the wonderful health benefits that our clients do. The majority of clients stop smoking after just one session of advanced hypnosis and Rapid Mind Transformation methods. Whilst there are no guarantees, clients have the peace of mind that, should they require an additional session within the first 30 days this will be provided free of charge. Pain free, drug-free and 100% natural. This unique system is enjoyable and powerful. Helping you to take control and lead the new, healthier life, free of the shackles and chains of smoking. You will remain conscious and in full control throughout. Most of the session will be using eyes open methods. Nothing to worry about. Do you need willpower to Quit Smoking? This system will only work if you are 100% committed to stopping smoking. It will not work if your spouse or family member is pressuring you to stop. You have to want to deep inside. You have to be committed to following all the steps and tasks involved. All the homework tasks before and after your session. If you don’t want to change any of your old habits then you will simply remain as you are. It is perfectly natural to be apprehensive and maybe even a little bit fearful of quitting. Even the word quitting implies you are giving up something. In fact our mind transformation processes make you feel empowered so you do not feel you are missing out on anything. And you are not losing out if you give up something you just don’t want any more. You may wonder what you will do with all that extra time or those hundreds of pounds every month to spare. What will you do between TV adverts or when you have that cup of coffee. In reality you are gaining a wonderful healthy life, prolonging your life by 6 to 10 years. Repairing your lungs so you have more energy to do things you couldn’t do as a smoker. One of our clients from Wokingham came specifically because he saw his friend who had in his own words “the willpower of a gnat” so he knew it must work if his friend could stop after one session. You will feel fantastic as a non smoker! Do Quitting Cigarettes make you gain weight? When people quit using Cold Turkey or Willpower methods to Stop Smoking it is very common to gain weight. What is happening in your brain is that you think you are missing something and feel lost without a cigarette in your hand so those ex smokers quite often turn to food, chocolates or biscuits simply because they feel a loss. With hypnosis and NLP there is no loss as you don’t actually desire to smoke. You don’t feel you are missing out as you don’t want a cigarette. This is what allows you to progress without cravings or desire to smoke and no weight gain. You find other things to satisfy your boredom and other ways to naturally relax and enjoy the healthy life. 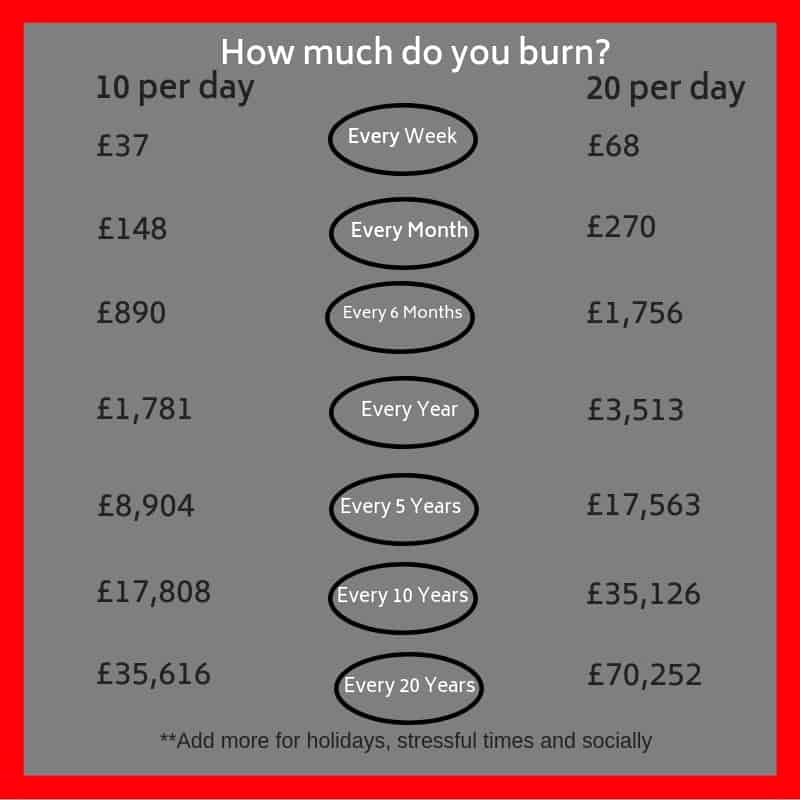 How much do you Burn every week, month year? or you can Quit Smoking any time via Skype if you live too far away to travel first have a phone chat to see if we are a good fit. Smokers are coming under increasing pressure to quit. The Institute of Actuaries published the results of a study it commissioned which showed that the mortality rate for smokers is twice as high as for nonsmokers, and that, on average, a smoker dies 6 years earlier than a nonsmoker. Surveys suggest that three in four smokers would like to give up, according to the anti-smoking campaign Action on Smoking and Health (ASH). Any statements or achievement examples provided are estimates of what we think is possible for you based upon our high successful outcome examples of previous clients and program participants. It is impossible to determine the exact results you will receive as a result of participating in or purchasing our programs and services. So many variables are at play in your success at goal achievement. Your success is solely determined by your own follow through and ability to execute the plan put in place and follow simple instructions during your therapy session. The system and methods remain the same but clients motivation or willingness to follow all the steps in the program will vary. For example refusal to change one of your cigarette triggers will affect the outcome. There is a 98% Success Rate with this System. Clients Successfully Quit Smoking after accepting a Task(s) created by Wahida without knowing what it is. In order to successfully Quit Smoking immediately instructions will need to be followed exactly, focused attention during our session. Instructions will be given guiding Clients with Rapid Mind Transformation techniques, Guided feelings, visualisations, embedded hypnotic commands during pretalk and followed by a Classic Hypnosis Quit Smoking Experience which is also embedded with hypnotic and post hypnotic commands. All Client get homework to do at home before the session and after the session, failure to complete tasks will have poor results. Accepting all tasks will have amazing results. The Successful outcomes seen in these Client testimonials are because the Clients wanted to Quit Smoking Immediately and were compliant with all instructions in the System. All tasks are are Safe, Ethical,do not cost extra and will not cause weight gain. Failure to do the Tasks renders the session void. You are paying for Therapists Time the results are free. Refunds are not offered as this causes an incentive to fail, to not quit or secondary gain in the clients subconscious mind. We will not be ethically responsible for human behaviour. All deposits & monies are non-refundable.